We made it through the week! Hooray! 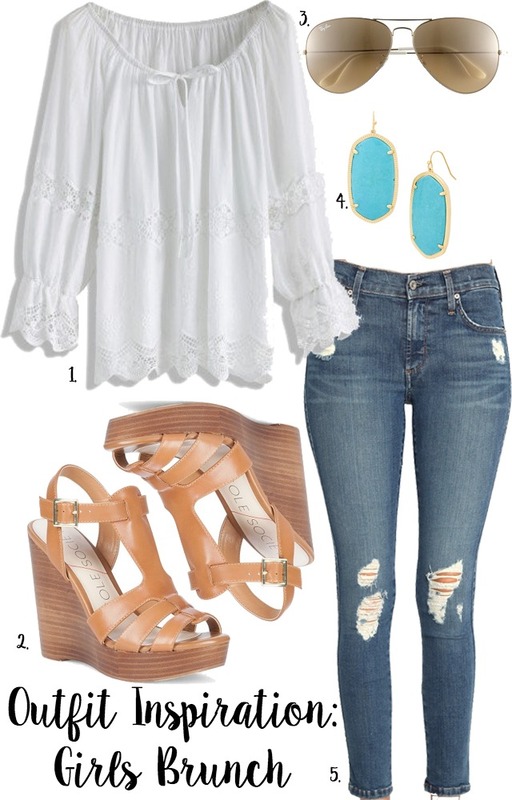 For the past two outfit inspiration posts they have featured an off the shoulder dress (see the posts here and here) so I decided not to do that today, but for those who love off the shoulder things, the shirt above can be! See what I did there? Anyways, I had to have that shirt in my life and ordered it last night. It has beautiful lace detailing and currently I am loving anything white! If you are interested order it now! For only $36 it is going fast, only 4 left (when I ordered last night there were only 9 left). I made a lot of returns this week so I may have to get my hand on these babies well they are on sale, but I am not sure how I feel about the height. I may give them a go. Well on the subject of shoes, from the Saks Fifth Ave friends and family sale picked up two pairs of Soludos. I wanted a new pair of slip ons and found these and then I couldn't decide which I liked better, so I ordered this lace up pair also because they are adorable and are on sale! So the slip on pair (I bought them in the cognac color) I have worn for two days now and it is safe to say they were a great buy! Easy to slip in and out and feel great on my feet. They also are just a great addition to my closet because you can seriously never have enough cognac shoes. I have been cleaning out my closet and got rid of a ton of stuff, I think in May I am going to try and challenge myself to not spend any money on clothing for the whole month, maybe with the exception of thrift shopping, but I haven't decided yet. The closet clean out is no way over with, I always go through it a couple of times, wish I didn't feel like I had to hang on to things, it would make things so much easier! Oh, one more thing. I have always liked Madewell, but when I went in there this week I fell in love! There are so many things I have added to my wish list (on the wish list because each item is a small fortune), and some are currently on sale!